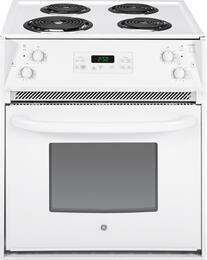 Drop-in ranges are an electric cooktop and oven combo that can be installed into customized cabinetry. Unlike most slide-in ranges, drop-in ranges don't have a storage drawer and sit above matching woodwork or cabinetry. Additionally, the controls panels and knobs are on the front of the range for easy access. This feature meets ADA standards, making it usable by virtually everyone. 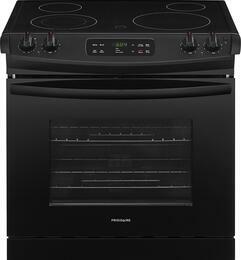 Electric drop-in ranges are available with two types of stoves, a smooth top surface and coil heating zones. All have a standard 4 elements with a burner output of up 3000 watts, perfect for the everyday cooking essentials. If kitchen space is limited, ranges with coil heating elements have a smaller width of 27 inches. Models with a smooth top cooktop have a 30” width size and makes it easy to slide larger cookware from one zone to the next. Hot surface indicators let you know when stoves are too hot to touch, ensuring fingers are safe from being burnt. Bake, roast, and broil anything you desire in the oven compartment. Oven cavities have up to a 4.6 cu ft capacity that can easily fit a large honey- glazed ham. You'll even be able to cook multiple dishes at once, cutting cook times in half. Oven racks can be adjusted to fit dishes of various shapes and sizes. Some have a dual baking system with top and bottom elements to produce even heating. By setting the cook time and temperature, the delay bake mode will get meals started without you having to be in the kitchen. The viewing window lets you check up on foods without opening the oven door and disrupting heating temperature. Clean-ups will be the least of worry thanks to the self-cleaning function. This mode uses high heat to loosen stuck-on residues, so you can have a sparkling clean oven in no time. Find a drop-in range that's a match to your culinary arsenal. 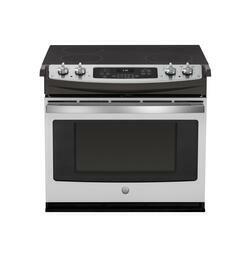 GE and Frigidaire offer models in stainless steel, black, and white finishes.